As the sun rises on Thanksgiving morning, thousands of grand meals are in the works around Dayton. As the sun rises on Thanksgiving morning, thousands of grand meals are in the works around Dayton, with seasonal favorites like stuffing, mashed potatoes and, of course, turkey. But when going to the store and picking up your fresh turkey, you might not know that the turkey was raised on a family turkey farm in New Carlisle. Bowman & Landes Turkeys produces turkey products of all kinds on its 145-acre farm, today maintaining an old-fashioned family operation that dates to 1948. Both the Bowman and Landes families remain involved in its operations, said Carl Bowman, one of the current owners of the business. 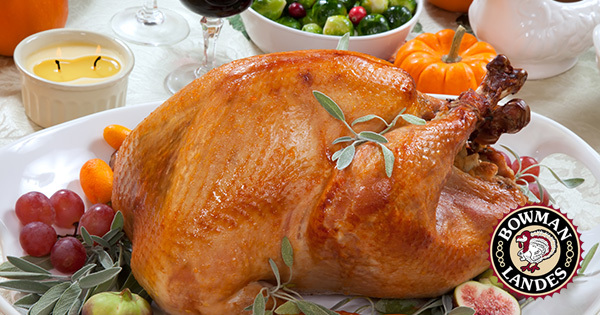 Today the company offers a large variety of products ranging from whole turkeys, bone-in turkey breast, boneless turkey breast roast, whole smoked turkeys, ground turkey, turkey burgers, turkey sausage, turkey deli meats and more. Bowman & Landes has a retail store on their farm located at 6490 E. Ross Road in New Carlisle where it sells its turkey products as well as other deli, meat and farm market items. "We try to source local products and things you can get in Ohio so people can appreciate those as well," Bowman said. The great demand for turkeys during the holiday season means the farms grow lots of turkeys for the holidays. "It's a small-town product made on a local farm," he said, "People know they are receiving a healthy and flavorful product that is raised and harvested on our family farm." "Local is important people again, which is great," Bowman said, "We've got to support one another if we're going to have a thriving local community."